Azure Service Fabric is the foundational microservices and orchestration platform that powers core Azure infrastructure. At the Microsoft //build conference earlier this year we announced the general availability of Windows Server container orchestration for Service Fabric. Today, we're excited to announce the general availability of Service Fabric on Linux for container orchestration in all regions, including national clouds. With this, you can now run containerized applications on Service Fabric for both Windows Server and Linux. We currently support Ubuntu 16.04 for the Linux clusters, other Linux OSes including Red Hat Enterprise Linux are on the roadmap. The runtime experience on Linux is identical to what you are familiar with on Windows as they use the same codebase. This familiarity creates an accelerated path for application development and deployment if you are using Service Fabric on Windows, and are also using Linux for some of your business needs. With this release of Service Fabric, which includes runtime v6.0 and SDK v2.8, you can take advantage of orchestration features on both Windows Server and Linux. By using Service Fabric to launch and manage container images, govern resources, complete service discovery with DNS, gain insights from using OMS integration, and with volume driver integration, you can truly focus on building applications and not assembling or building a platform across both Windows Server and Linux. We realize the importance of tooling in building great applications. On Azure, the Azure CLI 2.0 provides you with a first-class experience of managing applications and clusters on both Windows and Linux using the command line. If you are more inclined to using the Azure portal, we provide a comprehensive UI experience to create and manage clusters. Additionally, the existing Service Fabric Explorer (SFX) UI management tool to monitor clusters works identically for both Windows Server and Linux clusters. Service Fabric today has great development tooling focused on Visual Studio 2017 and PowerShell for Windows. We recognize that you have different tooling needs for Linux and so we have created a set of Java SDK tooling that ensures a first-class experience for Java developers on Linux. We have also open sourced most of the Linux tooling, which includes integration with Yeoman, Jenkins, and Eclipse. 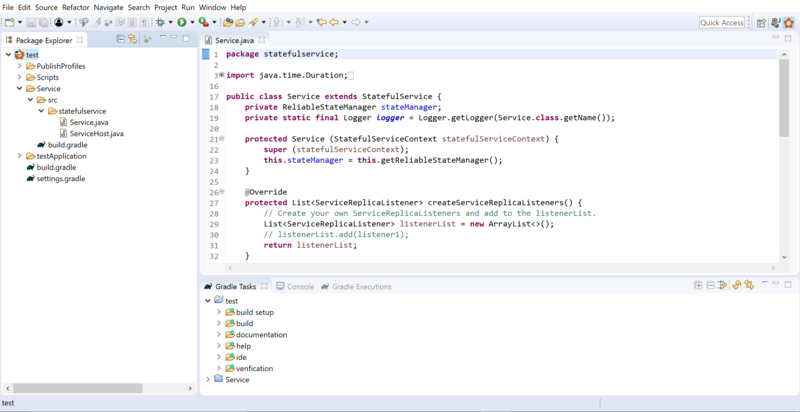 We're also releasing Service Fabric SDKs (v 3.0 preview) to support Java and .NET Standard 2.0. Service Fabric SDKs contain programming models including the Reliable Services and Reliable Actors for these languages. These models, familiar to existing customers using .NET, can be used to develop stateful or stateless microservices. Stateful Reliable Services automatically co-locate data on the same node that the service is running on to make applications highly available and reduce latency. Reliable Actors provide a simple to use actor programming model, which makes it easy to develop concurrent microservices applications. This release also includes the preview support for Docker Compose enabling you to deploy applications using existing compose yaml files. We are excited by the endless possibilities this brings to your application development. You can try these new capabilities in under 10 minutes with this quick start on Service Fabric for Linux. For more in-depth tutorials on Service Fabric, check out the Service Fabric documentation. If you have any questions along the way, please engage with us or join our monthly community calls. If you have specific feedback about the product, especially the new preview features, we’d love to hear about it. We can’t wait to see what you build!